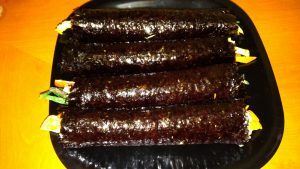 Making Kimbab rice rolls – Yori, Hey! Kimbab consists of seaweed laver sheets and rice. For the most basic kimbab, you’ll need ‘kimbab’ kim and steamed rice. It’s a convenient meal that can stay fresh all day, making it perfect for lunch at the office or a meal at the top of a mountain. The most difficult part of making kimbab is rolling, but once you get that down, it’ll be easy to make whatever you want. The first step is cooking rice. If you have a rice cooker, just follow the directions. If you are cooking on the stovetop, follow a 4:3 water-to-rice ratio. So, if you have 1½ cups rice, use 2 cups water. Rinse and strain the rice well to remove any dirt or pesticides. In a cooking pot, add the rice and water and let it soak for 30 minutes. Now turn on the heat and cover the pot. Once it starts boiling, turn down the heat to low and continue to cook for about 15~20 minutes. Once it’s cooked, mix the rice to prevent it from caking together. If you are using brown rice, add up to a quarter brown rice to white rice (ex. ½ cup brown rice and 1-½ cup white rice). Brown rice, while healthier due to being a lower glycemic option, doesn’t stick together. Once the rice is cooked, move a few scoops to a mixing bowl. Add a dash of salt and a few drops of sesame oil. Mix well and cover until you are ready to make rolls. Beat a two or three eggs and heat a frying pan. Add some oil once the pan is hot and pour the eggs into the pan. With a cooking spatula, work the egg, moving the top runny part to the pan surface. Roll the pan so eggs spread over the whole surface. Once the egg is just a little runny, lift one end and start to roll and fold the egg until you have one wide strip. Press the omelet down and flip so both sides are slightly brown. Move to a plate to cool. Once the omelet is cool, cut it into thin strips about ¼-to-½ inch wide. All of the other ingredients should be cut into thin strips. If you have a bamboo or wood kimbab roller, set that on your counter. Take a sheet of kim and lay it on the counter (or wooden roller, if you have it). Take a rice spatula and dip it in water. Now take a scoop of rice and place it on the sheet of kim on the side closest to you. Spread the rice out evenly, but leave the top quarter empty. This is done so the roll with stay together. Lay out the other ingredients, placing just a strip or two of each on the bottom (again, side closest to you). Now lift the bottom end and start to roll it up, pressing down and squeezing the roll until you reach the top (this will be the ‘seam’ side of the roll). Move the roll seam-side down to a plate and repeat the rolling for however many rolls you want to make. Once you are finished rolling, take a cooking brush and dip it lightly in sesame oil. Brush the tops of all the rolls. This will give the rolls a nice sheen and also serves to improve the flavor and texture of the rolls. Keeping the rolls seam-side down, move one roll to a cutting board. Hold the roll just before each cut and make ½-inch cuts. 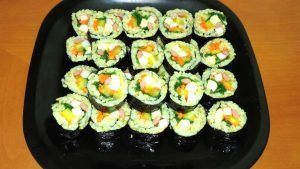 And now you have Korean kimbab, ready to pack or serve. Be sure to keep the rolls covered so the rice doesn’t dry out and become hard. You can try any combination of filler ingredients. It’s even possible to replace the rice with noodles to make ‘kim-guksu’ for an unique, unusual meal. Let us know if you tried making kimbab and how it turned out. If you have any questions, post them below.